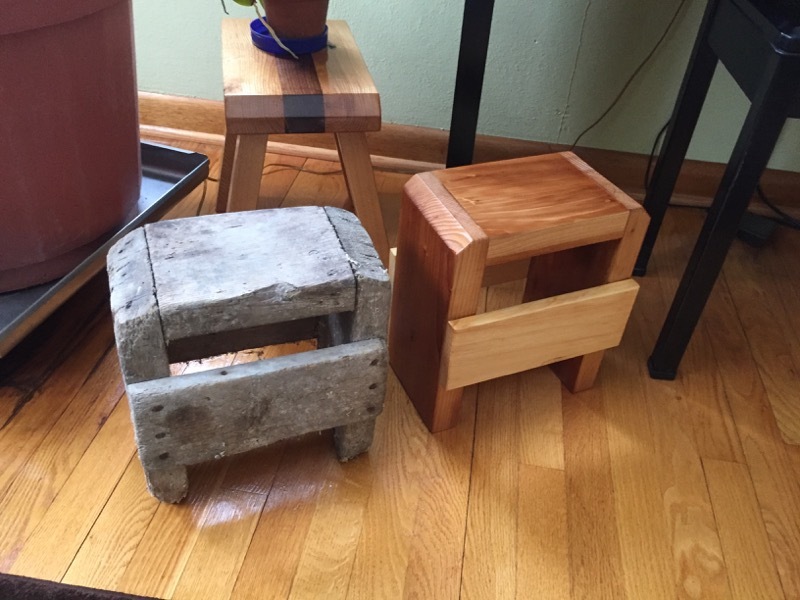 In 2010 many things in my life came together and the results have been manifest as some quirky stools and not-so-quirky plant stands. When I retired, in 2008, the people I worked with took up a collection for me. It was a very generous check that my wife used to help pay for my birthday present; a beautiful Delta table saw. I have always loved working with wood but have never taken the time to become more than mildly proficient at the craft of woodworking. Finally I had a piece of equipment that was better than I was and I accepted the challenge by tackling these stools (and stands). As it turned out this new hobby served more than just helping me fill some of the void left by the hours and days that I was no longer working for someone else. In 2001 I was diagnosed with stage II bladder cancer. The early stages of treatment required that I undergo three months of Chemotherapy. As anyone will tell you who has gone through this, one of the hardest parts of chemo is finding something to take your mind off of feeling icky all the time. And sitting around just doesn't do it. By this time I had pretty much worked out the details of this fairly complicated construction process which left me with repetitive steps that didn't take much thought but still required all of my attention, both to keep me from cutting off a finger and to deal with mistakes. The result was the construction of 10 stools and 10 stands. Many of which had some interesting mistakes that, I believe, add much to the beauty and - dare I say it - add much to the art. 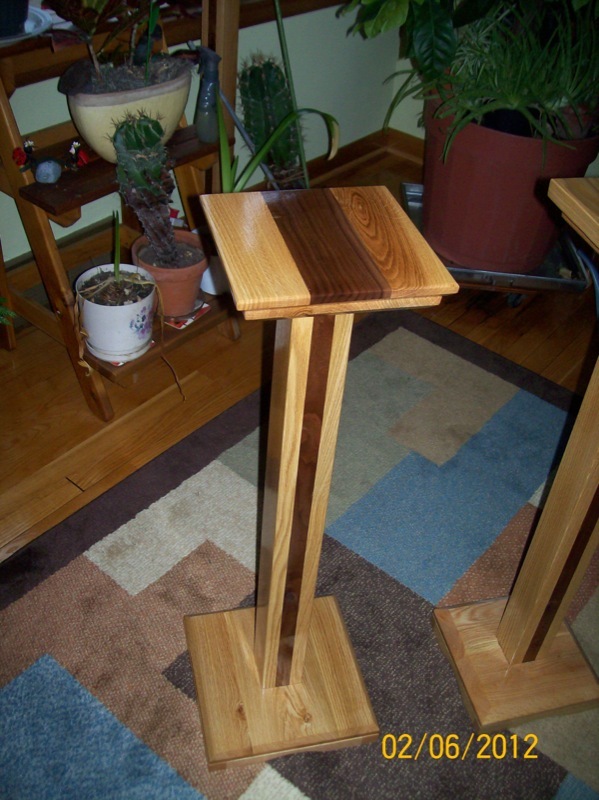 I have built this section of my web site to document the process I went through in learning how to make these stools and stands. And to document the mistakes that led to the uniqueness of each. 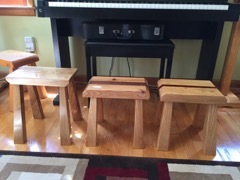 So, each stand and each stool has a story and I detail each of these stories on this site. I believe that Artists welcome mistakes because these mistakes can lead to something wonderful. 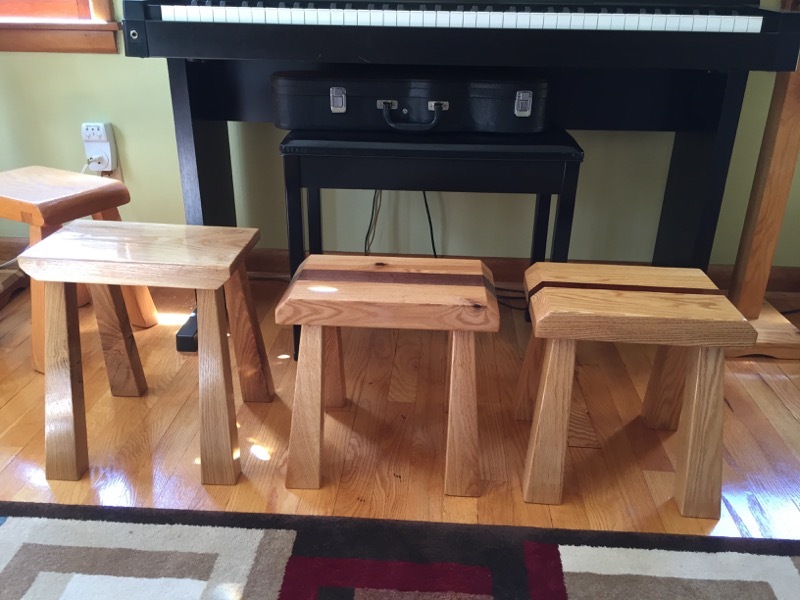 All the following are crafted from Wisconsin Hardwoods. 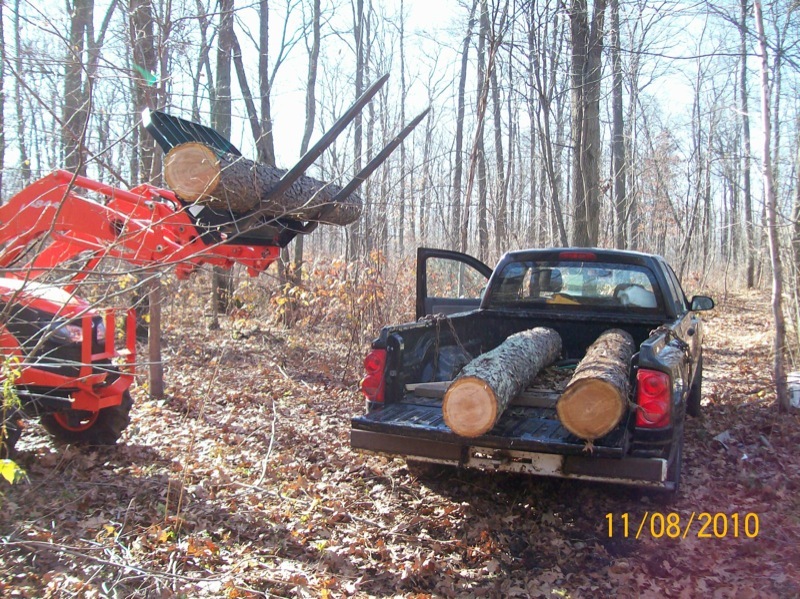 Trees are harvested from family owned woodlots and forests located in Polk County (northwestern Wisconsin), sawn in local mills, and dried in the attics of our houses and garages. NEW: With some construction notes added. 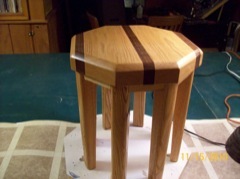 Stool #2 - First attempt at hardwood stool - Red Oak with Walnut center stripe continuing down legs. Stool #4: Red Oak with a walnut stripe in center and two edges - legs ALL red oak. Raw Materials: Harvesting, milling, and processing lumber for stools and other projects. 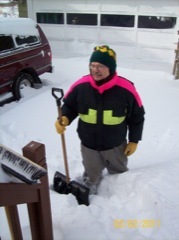 Winter Break: For cancer surgery followed by workshop too cold for comfort. Stool #8 ( and stool #9): It's almost August so it's taken me a while to get back into making stools after the winter. The next two are smaller and a little more refined. White Oak and Walnut. Smaller and a little lighter in weight. Stands #4 and #5: These two stands are pretty much twins. Stands #4 & #5 before finish. These stands have taken all summer (2011) to complete. I feel bad about that but it's been a busy time in my life. I've work over 120 baseball games (Umpire) and we're in the process of taking down an old barn on our tree farm . These woodworking projects take a back seat. 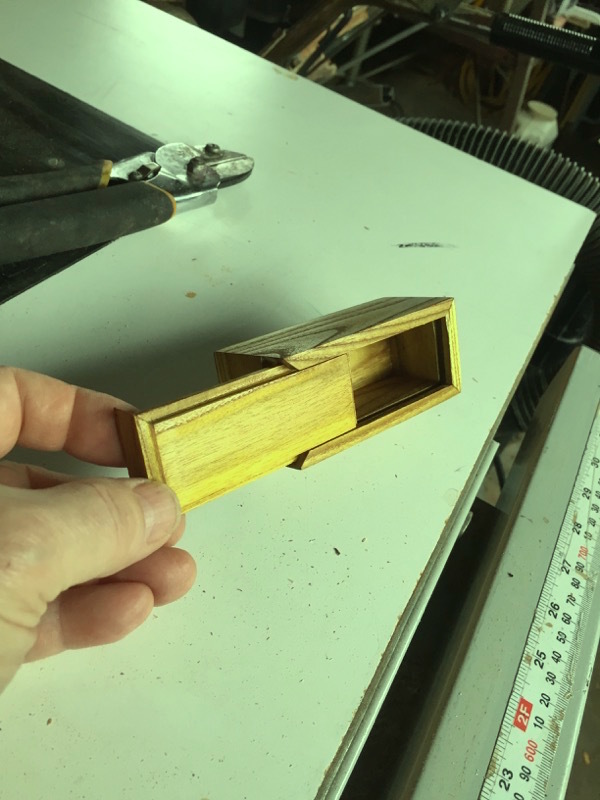 I have also been working on a larger project in wood - not a stool or a stand - that is taking a lot of my time and attention when I'm in the wood shop mode. Stool #10: Made from rafter boards recovered from the demolition of the barn on our family farm. February 2012: This past summer we have been de-constructing the barn at our farm in North-Western Wisconsin. The roof of this barn had been blown off by a tornado in 1952 and my father and brothers replaced it using materials from the old roof as well as lumber milled from logs harvested on the farm. Stand #6: This is a test piece to try out some new specs and techniques. I have stuck with Red Oak and Black Walnut for this stand. The top is 8 inches square and the base is 12 inches square. Stands #7 through #10: Two pair of speaker stands. 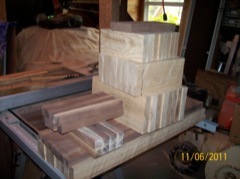 November 2011: While working through the assembly of Stand #6 I went ahead and cut out the parts for the next four (4) stands. Some assembly required. As of February 2012 I have finished one pair and am now assembling the second. Working in the winter requires a lot of moving around. I decided the garage is too cold so I had to clean out my basement to get enough space to work. Not wasted effort but it took a long time. Taking a break from stools and stands for a bigger project. 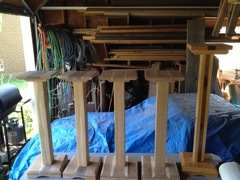 Work on stools and stands has taken a back seat to this larger project. 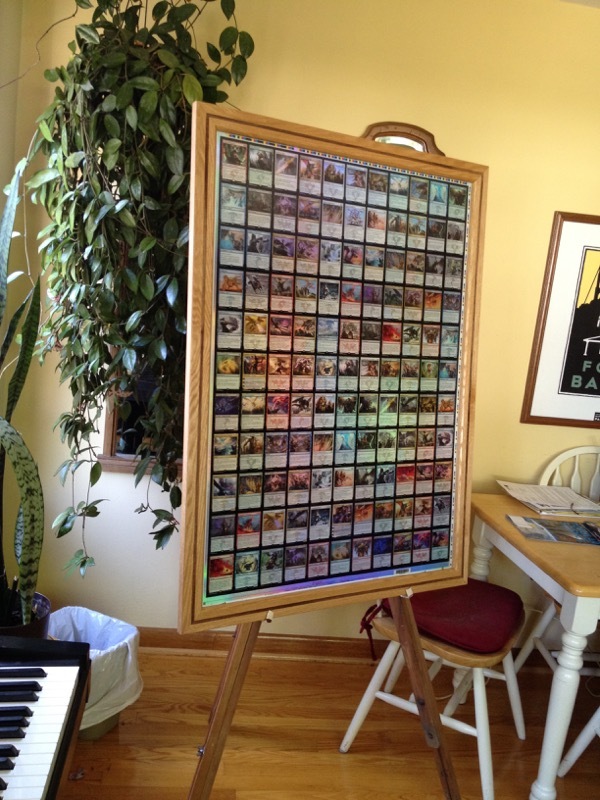 NOTE: I have temporarily set the unit with only one shelf installed for these pictures. 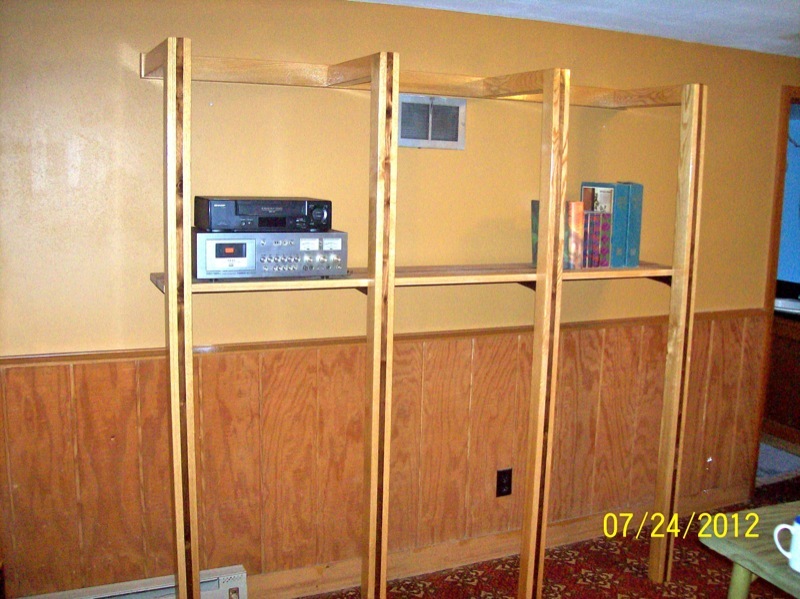 One day my son came to me and asked if I could build him some shelves for his room. 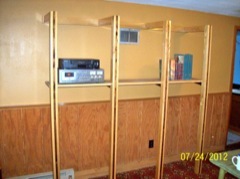 He needed a place to store some of his card collection as well as a place to set things in front of his windows. He was currently using a rusty old typewriter desk and he has outgrown that look. He lived in Japan in the study abroad program in college and has always loved the Japanese culture and architecture. He also shares my preference for heavy - sturdy - furniture. He showed me a sketch of an idea he'd done on the back of an envelope and I said I'd think about it. He wanted something that fit together like a puzzle and could be assembled without fasteners. This is the my first attempt at mitered corners for picture framing so I had to practice by building some smaller picture frames. 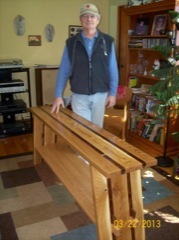 I ended up building the jigs and fixtures for making miter cuts so this project was more involved than the end result. Mary has a new house so we need a house warming gift. Her new floors are all Black Cherry so I decided to drag out some of that wood from our logging operation. She already has a tall plant stand and mentioned that it would be nice if it were a little shorter so that it matched the level of the windows sill in her living room. A woodworking friend of mine always says he makes twice as many copies of each project because the set-up is the most time consuming part. 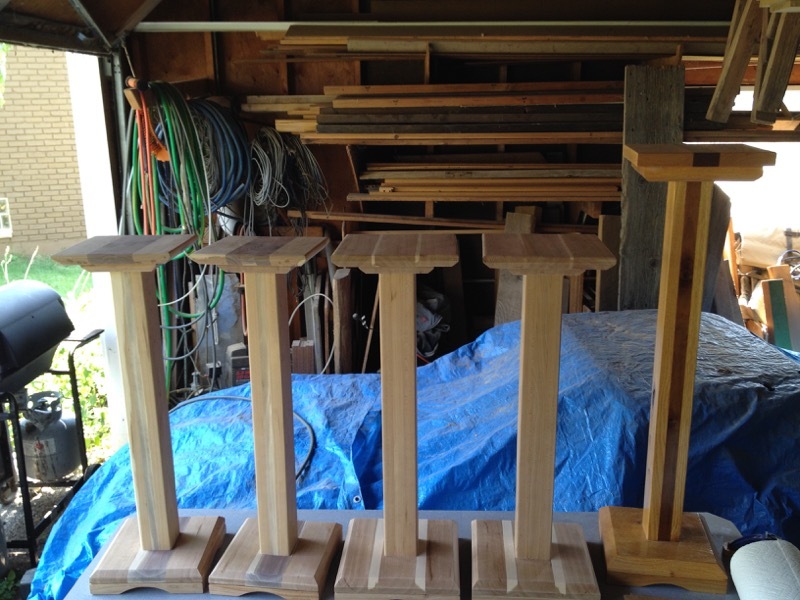 We plan to give Mary two matching stands so I decided to build four. Note: I don't have any good pictures of the end products but I am including a bunch of photos of the process of building these stands. Many of the ideas for projects have come from my brother Roland. 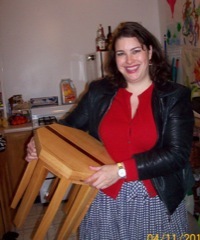 The 8-legged stool. The one legged plant stand. These were some of the designs that he has come up with over the years. He only made a limited number of any of these designs and they were snapped up quickly by family and friends so if I wanted to have one, I would have to build my own. The only piece of Roland's work that I have managed to acquire is a four-legged milking stool. Since I have one of these I haven't been in a hurry to build one like it. A copy of a 'real' milking stool. When I tore down the old barn at the farm, I found an old milking stool that we used to use when I was growing up. I'm sure my father made this (and all the other stools) and it was the low, simple, sturdy stool that would withstand being thrown out fo the way by the person milking (and kicked out of the way by the cow being milked). I decided to make a copy of this basic stool. I used some wood I had laying around the shop. The main part is from the side of an old waterbed from the 80's. When the water beds were no longer fun, I tossed the bladders but I saved the sides since it was nice straight grained Pine or Spruce. I knew I'd find a use for it eventually. The cross pieces are another kind of pine or spruce from some boards that my neighbor had thrown out (put on the curb) a few years ago. This finishes lighter than the waterbed wood. 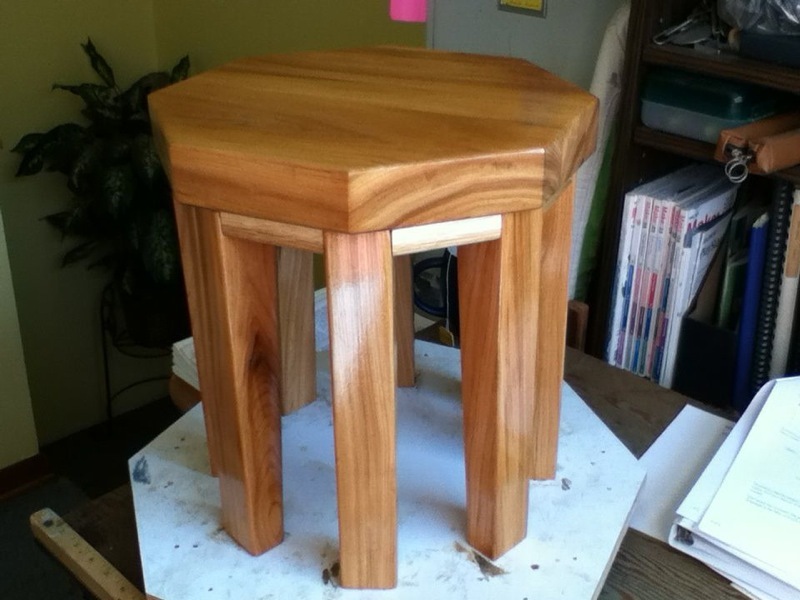 I have used no stain on this stool; just 3 coats of clear gloss Polyurethane. 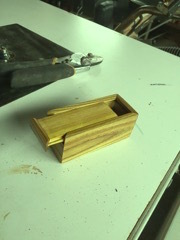 Sliding Lid box made from Red Sumac wood. A couple years ago the Railroad cut down all the Red Sumac along the tracks that run behind our house. 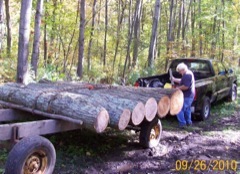 I ran out that night and 'rescued' all the bigger sections of trunk. (They had just left it there to rot.) I split each piece once and stacked it in my shop to cure. Now I simply sliced off some boards 1/4" thick and this is my first effort. I found the idea and some basic instructions on the PBS web site for The Woodwright's Shop with Roy Underhill. He uses these great old planes that I can't afford, so I had to make some jigs for my table saw. I did this more for safety than anything because it's dangerous working with these small pieces on a big saw. It's hard to keep your fingers at a safe distance from the blade without some sort of jig and/or slide. 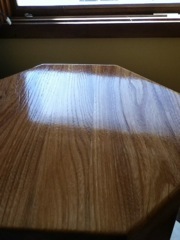 This wood has a beautiful green tint to it that doesn't really show in this picture. Unlike the red in Box Elder, this green seems to stay with age. My brother made a nice little cabinet out of Red Sumac many years ago and it's still green. I finished this box with clear Tung Oil (for a change of pace from Polyeurethane.) Just two coats -- for now. Click on the pictures for larger view.